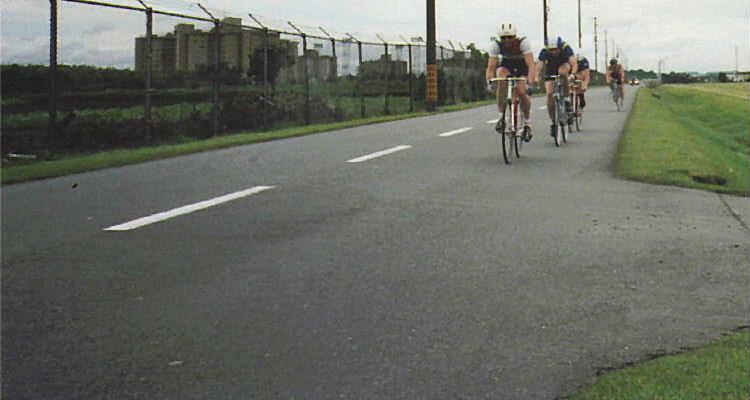 Yokota Airbase held an annual 32 kilometer bicycle race (it was actually 34.5 kilometers though) and Keith Orme, our friend/rival from Camp Zama was racing. We, being Volvo, had to win here. J.T. and I called a team meeting (J.T. being the manager and me, team captain who was appointed by J.T.) and discussed how to deal with this. My last win was boring, way too easy, and I wanted to see if we could be a real team and support another rider for a win. Joe Zamora, mediocre until May 1989, was on fire. I’d been riding with him and he was unbelieveable. 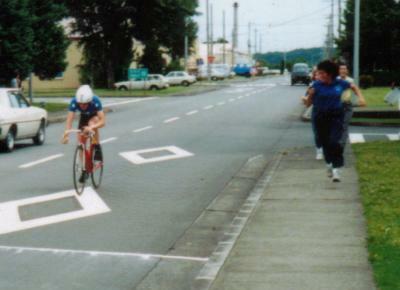 On training rides, he’d been out sprinting me, and came within seconds of me on the climb to Okutama. No one from the team had ever come that close to me on that climb before. 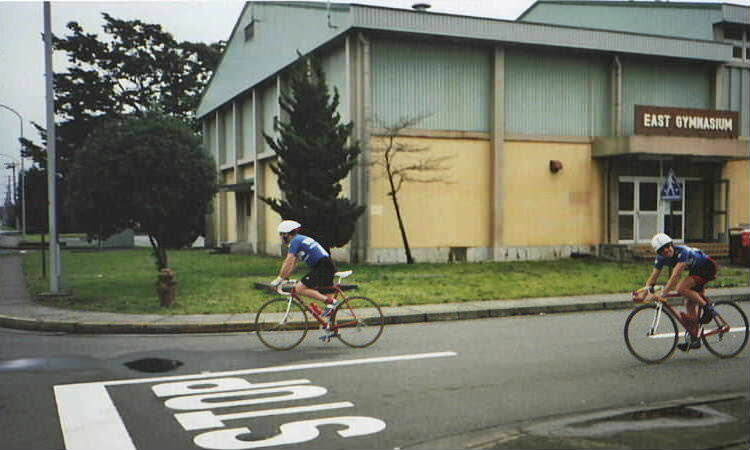 Art could out-climb me but was a long-distance time trialist, which didn't help him much in the mass-start races, and he was so busy training for his triathlons, he rarely raced with the team. But it was scary how much Joe had improved...so we picked Joe to win. J.T. had a serious knee injury and couldn’t compete so he would follow the race on a motor-scooter. We had myself, Joe, Chris, and Doug (Craig was off the team due to inner-team disputes and accusations of bicycle theft). Doug and Chris, the two newest guys, would control the race...keep Keith in check (HA!!!) while Joe and I would stay in contention and conserve our energy. 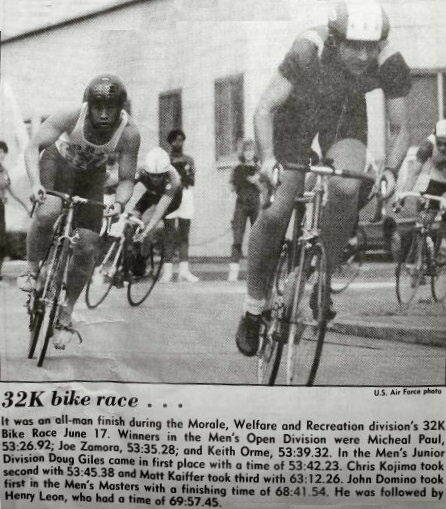 On the last U-turn, I'd break with Joe and give him a 2 1/2 mile lead-out, whereupon we'd hold off Keith, who was a fearsome sprinter. Joe could out sprint me but I could ride off alone at high speed better than he could. If Keith was to catch us then Joe, rested from sharing the pace with me, would still have a chance to out-power Keith. 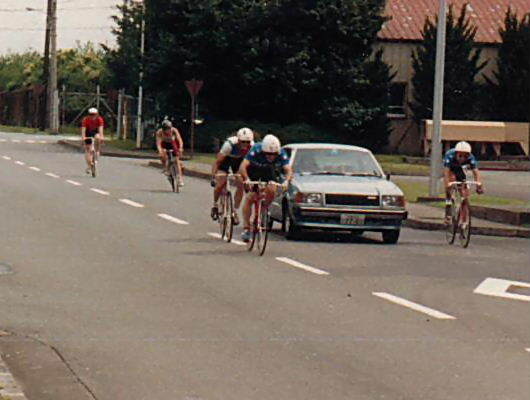 We were afraid it would come down to a mass sprint and Keith would win OUR base with all the Volvo jerseys behind him. 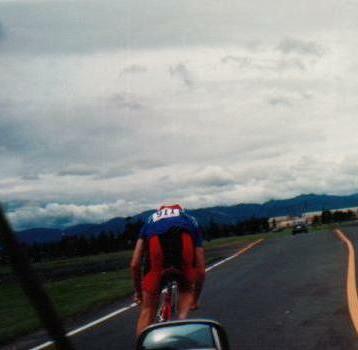 We did a few team training rides with Joe and I rehearsing the whole thing and terrorizing the local drivers…hehehe. We had three cameras, a television station and a newspaper covering the race. Here are some shots of Joe (red bike-blue shoes), Doug (pink bicycle-no helmet), and me (tiny person) clowning around during the warm-up. There are quite a few photos of this--obviously J.T. was shooting these and encouraging us. 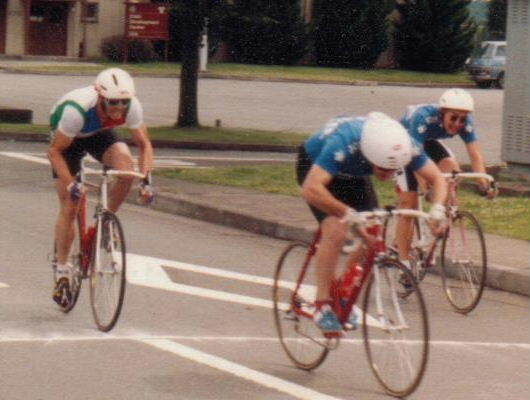 Here we are shortly after the rollout, Keith in the front tightening his straps on his toe clip, Criss to his side in the tank top (odd attire for a bicycle race), directly behind Keith Joe, and behind him, me, shadowing the danger man already. 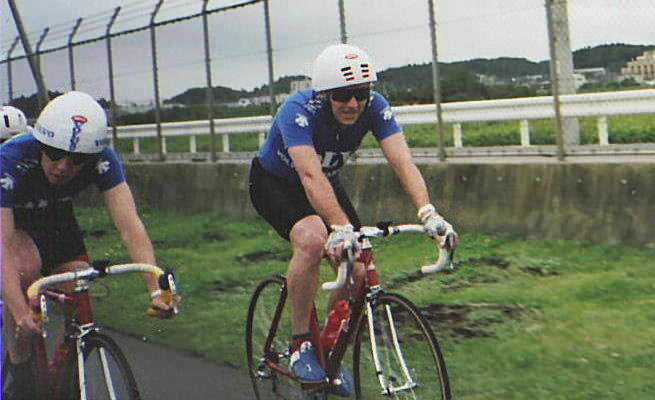 Doug and I closed up the holes in our helmets to improve aerodynamics--the day was cool after a night of heavy rain. I took it a step further, wearing my winter shoe-covers to smoot airflow around my shoes--I was expecting to do a long lead-out for Joe, so I wanted to be as slippery in the wind as possible--although the extra weight on my shoes would've slow acceleration on a spring. Joe jokingly called me,"Santa's little helper" because of how ridiculous the shoes looked. Below that, J.T. on his moped obviously asking Joe and I to smile or some silly thing--I was so nervous I had to be silly to cut the tension. My monkey face served the job. The wind was very heavy that day. A ten-man break immediately formed including Keith and all the Volvo riders. A pattern developed…a rider would ride off the front of the group and we'd sit back, watch him gain distance for a while, and then reel him in. This happened repeatedly and no one got very far from the group. 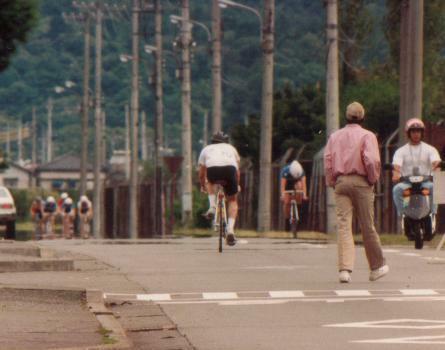 Above, you see the dude in the red with black suspenders off the front, heading into a very heavy wind (he was an aggressive rider), and in the next photo, Keith leading the chase to catch him. It was pretty routine, and Keith, Doug, Joe, and I were plenty strong to catch the breakaways, but then Keith started getting spunky in the chase. In the below photo, you can see that he was opening a gap on the guy behind him, with Joe and I two riders back--a bad sign. J.T. would pull along side of me on his scooter and say,"Conserve energy MIKE", knowing how I liked to pull pacelines and chase breakaways by myself. He always tried to teach me patience and strategy, but sometimes in racing you need an outburst. J.T. 's job was to watch the race and make sure the outburst counted. 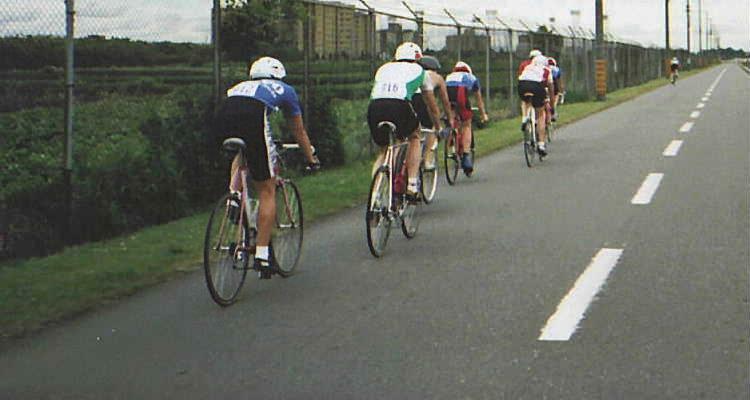 Below two photos, I'm in the blue jersey with red-striped shorts, Keith in green. 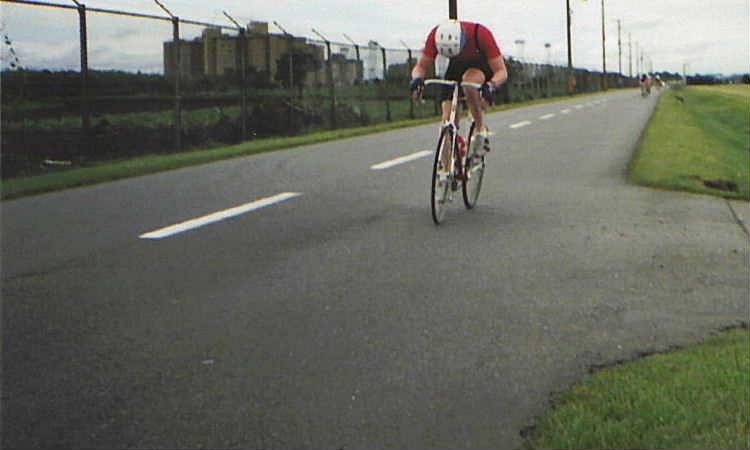 You can see how low I am on the bicycle--on training rides, teammates complained I was so small they couldn't get a draft from me. Our team plan was working but I didn't feel Chris and Doug were vigilant enough with Keith. That was my opinion at the time, and I wanted to take care of the danger rider myself. He'd take off and I'd look for them and say,"uh...guys?...that's him...he's uh...going...go get him...what are you waiting for?" Keith wasn't a guy you gave a long leash to, and J.T. was so concerned with not wasting energy I was afraid we'd let the race slip away by conserving a too much. 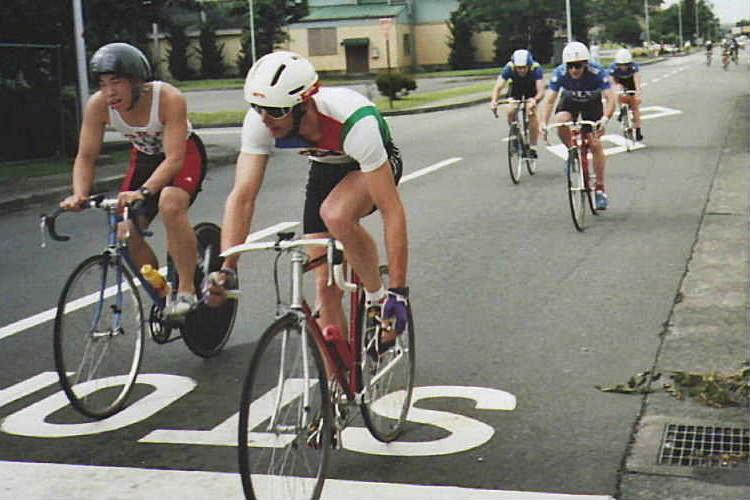 Eventually I tried controlling the race myself, whether it was a good idea or not. On the photo below I'm jumping from the group to go after yet another lone escapee. 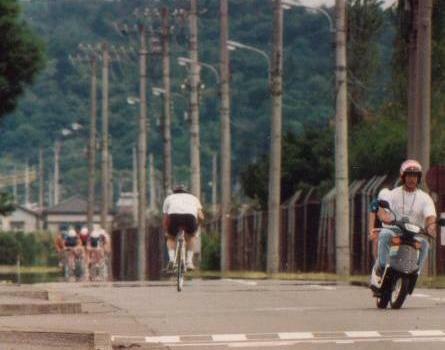 As I recall, when I did that, Keith lept from the back and flew past me. I marked him and we were surging at 40 miles an hour just to reel in the break! So much for conserving energy. I was very nervous about Keith. 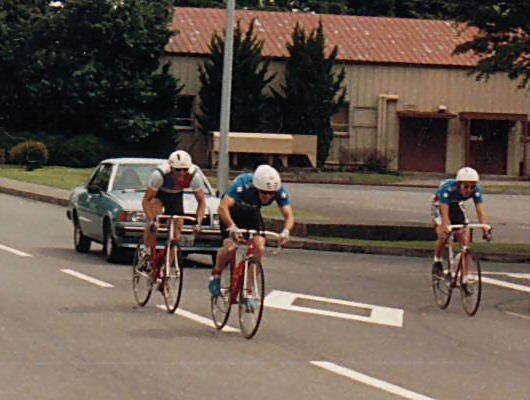 On the last lap, Joe and I moved to the front, the pace slowed. 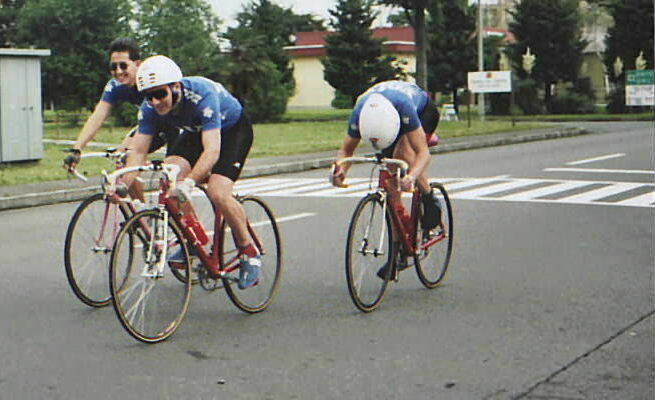 We were riding into a block headwind that only allowed us about 23 miles an hour even at race speed. Not suspecting anything from us, the group allowed Joe and I a few feet of lead. Quietly we spoke to each other. I told Joe,"When we turn, I'm going hard...so hang on. It has to be a surprise and it has to be quick". We didn't dare make any moves until the turn because we didn't want Keith to latch on to us and draft us to the finish. I accelerated slowly out of the final U-turn, checked that Joe was in my draft, and as the other riders rounded the final turn, I blasted off. I went so hard Joe lost the draft, another rider got on my wheel and I rode him off, and J.T. on the motor scooter couldn’t catch me. I was gone, maintaining 37 miles an hour for the first kilometer, and all I could hear was wind, and a faint J.T. yelling from behind. I never looked back to see the chaos I'd caused. I thought Joe was on my wheel. After chasing most of the first kilometer, J.T., on his motor-scooter finally caught me before a sharp left-bend. I asked,"WHERE'S JOE?" to which he yelled,"KEEP GOING, THEY DON’T KNOW WHAT'S HAPPENING!!!" With my head down, J.T. led me through some of the hairy turns on the 2 1/2 mile run to the finish. 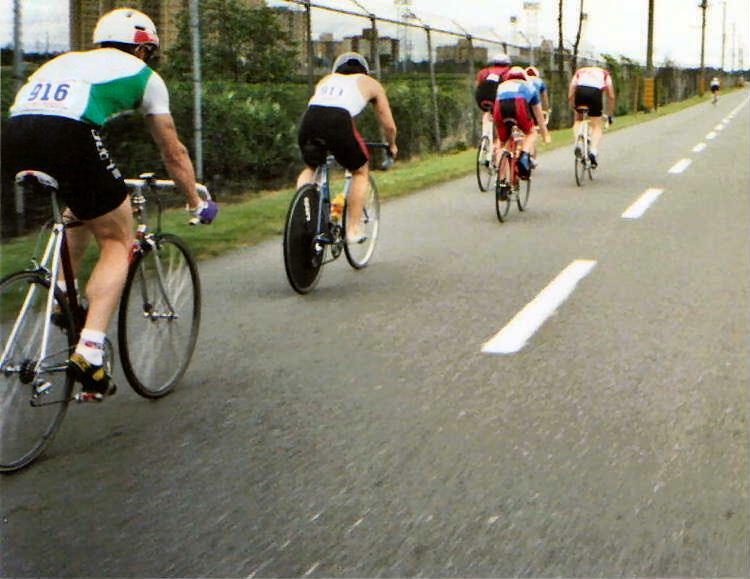 We came back so fast on the last lap that the road wasn't clear of traffic, and race officials weren't at the finish. They had to run to reach it (see finishing shot with heavy-set lady in blue running to the finish). The slow race had exploded. By the time I reached the finish I could only maintain 31 miles an hour, but I'd held off the charging pack. Unfortunately, I told my boss I'd work that morning after the race, so I never stopped at the finish...I just rode on to work and returned to the finish 30 minutes later to find out what had happened. Doug's father shot the last six photos (Doug is 3rd on the last three photos and Chris is behind him). I'd taken off so fast, the pack milled around for a while not knowing what to do. All the other breaks had been easily caught. J.T. 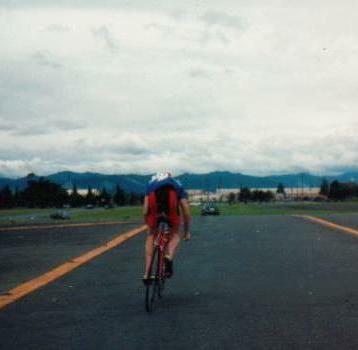 later told me he was shocked at how fast I took off...and he never stopped telling me 'til the day I flew out of Tokyo. I guess fear has a way of bringing out the best in us. Keith and Joe did a cat-and-mouse game for the last 2 1/2 miles, shaking off everyone but Chris and Doug (my mates). They hit the line at 45 miles an hour, almost crashing into an unsuspecting motorist, and Joe out sprinted Keith for 2nd! Anger brings out the best in us too. Doug took 4th, and Chris, 5th, two of the most outstanding 17 year-old competitors I'd ever seen. I apologized to Joe for the mess I'd caused but we both knew that once the move had been made, we couldn't go back. He smiled and said,"No problem Mike". Joe was cool, and his performance in holding off Keith in a head-to-head sprint was quite impressive. It was a few months later that we realized Keith was even more dangerous than we'd ever given him credit for, so it was good to have beaten him in his prime. As for Volvo, we had four of the top five placings again, and we'd held our turf. Our hearts soared like a hawk.